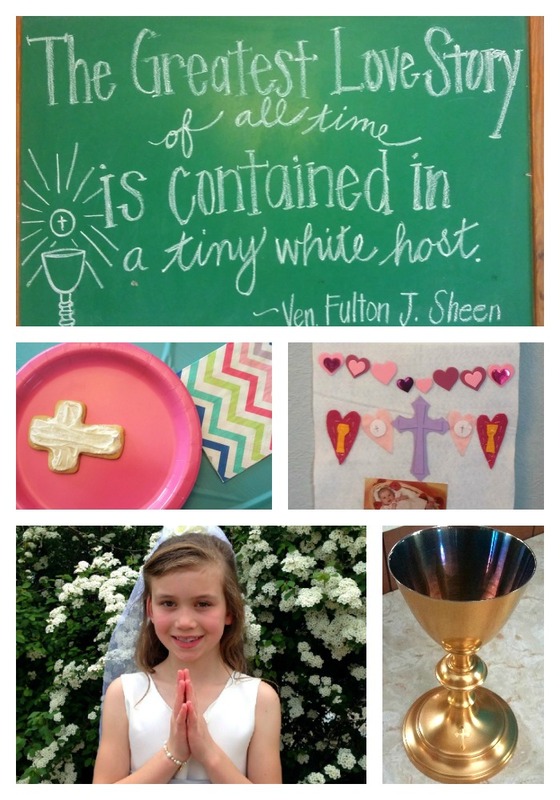 L made her First Holy Communion at the beginning of May. She had been preparing for it all year. Her religion classes all worked toward it and at home we discussed the Eucharist, Mass, the state of grace, the foretaste of Heaven. We attended family adoration and began a new nightly family prayer routine. Earlier in the school year she made her first confession. The church was filled that Wednesday night with the sixty kids from our parish and all their parents. L sat with her list that she had carefully written down in private. She was nervous and excited and afraid, a bit like all of us before confession. When she was done she came back to the pew and said, "That was great! I want to do that again on Saturday!" We went out for ice cream to celebrate - as did several other families. We didn't go back that Saturday but we did return several times throughout Lent and the weeks before her First Communion. The week before we went to confession one last time in preparation and then bought a treat to celebrate the sweetness of God's mercy. All the kids made a banner to hang on their family's reserved pew. L made hers all by herself. She cut out the felt chalices and hearts (okay, I did even and smooth those out a bit) and then she stitched them on to the white felt banner. She picked out a baby picture and attached it. She fixed on her letters, provided by her religion teacher, and I was so proud of her. It's a perfect glimpse of my little girl. And then the day came. We baked cookies - shaped in crosses and hosts, per L's request. We cleaned the house in preparation of guests. We made pink lemonade and L's godmother wrote a fitting Fulton Sheen quote on our chalkboard. We arranged for the chalice from Sheen's traveling Mass kit to be used at the Mass, thanks to the thoughtfulness and kindness of some friends. We did her hair, put on her dress, tied her sash, and placed her veil. The veil had been mine, the blusher from my wedding day. L's godmother adorned it with flowers to make it special. Her great-grandmother gave her a special bracelet, which she loved and immediately wore. Our parish has the entire family - parents and siblings - go up with the first communicant. So when the time came L and Travis and B, J, T, J and I all headed up. Baby Tee stayed with Grandma B but Trav and I were able to receive Holy Communion right with our daughter. Afterwards (and before, actually) there were lots of pictures. Family and godparents came and we celebrated. And L loved it. Just beautiful. Made me tear up, and I'm not even preggo. Congratulations to all of you. My second daughter received her First Communion this year as well (and then we had the fourth daughter baptized the following week :) ). I looooove that they have the family receive together! Such a great day! I can't believe how quickly L is growing up... First Communion already! Wonderful.